Movies featuring food as a subject or theme are a relatively new sub-genre. Steve Zimmerman's Food in the Movies shows the progression of food moving from being used merely as minor props or storytelling devices to the many films where food is an integral part of the theme or plot of the film, and the eventual creation of the food film genre. The book features over four hundred movie scenes where food is an important component to the story. Definitely recommended for the food film fan! Babette's Feast is a 1987 film that is widely considered to be one of the best food movies ever made, and will be screened at the Devour! gala event this year. Did you know that the film is based on a short story written by Isak Denison in her anthology of short stories, Anecdotes of Destiny? Babette's Feast tells the story of a skilled French chef that is forced to leave Paris, and finds work in a repressive religious household in 19th century Denmark. When Babette wins the lottery after spending years cooking bland food for a pair of elderly sisters, she spends her entire winnings on cooking an extravagant banquet for the community. Despite the sisters' ingrained distrust of pleasure, the feast transforms those around the table. Documentaries and non-ficiton books about the health and environmental effects of the modern food industry are changing the way we think about our food systems. Michael Pollan's In Defense of Food: An Eater's Manifesto is a classic in this genre, and is the inspiration of a new documentary film of the same name. Pollan sees modern society's obsession with fad diets and nutrition making us more unhealthy than ever: "Pollan proposes a new (and very old) answer to the question of what we should eat that comes down to seven simple but liberating words: "Eat food. Not too much. Mostly plants." Pollan’s bracing and eloquent manifesto shows us how we can start making thoughtful food choices that will enrich our lives, enlarge our sense of what it means to be healthy, and bring pleasure back to eating." Publisher. Many of the unhealthy aspects of our modern food processing industry are being exposed by investigative journalists who tell their stories in documentaries and in non-fiction books. Salt, Sugar, Fat: How the Food Giants Hooked Us was written by Michael Moss, a Pulitzer Prize-winning investigative reporter at The New York Times. "Salt, Sugar, Fat is a journey into the highly secretive world of the processed food giants, and the story of how they have deployed these three essential ingredients, over the past five decades, to dominate the North American diet." Publisher. 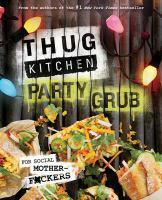 The creators of Thug Kitchen, a foul-mouthed, trash-talking vegetarian food blog, will be also speak at this year's Devour! festival at a workshop, with the Trailer Park Boys appearing as special guests. Their edgy vegetarian cookbooks have been on the bestseller lists since they came out, and it's not just because they're making vegetarian food cool: "This book is an invitation to everyone who wants to do better to elevate their kitchen game. No more ketchup and pizza counting as vegetables. No more drive-thru lines. No more avoiding the produce corner of the supermarket. Sh*t is about to get real." Publisher.